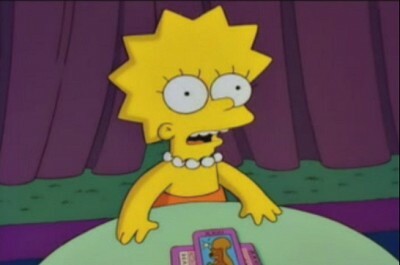 The Happy Squirrel has become a bit of an in-joke in the tarot community since it first appeared in the Simpsons episode Lisa's Wedding in the mid 1990's. 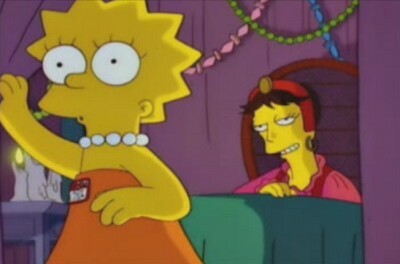 As the episode of Simpsons is pretty hard to get hold of, here's a storyboard of the Fortune Teller scene. 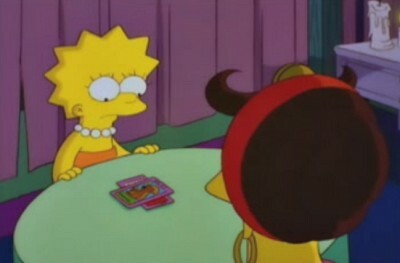 As far as I can guess, the writer of this episode Greg Daniels created the Happy Squirrel card for this episode. Yay for popular culture! 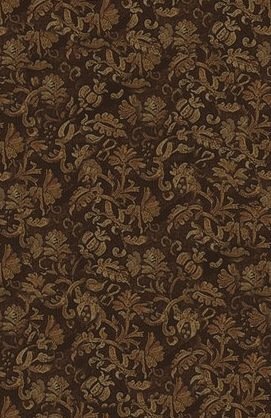 If you bought a copy of Touchstone Tarot, you may have been a bit puzzled at the inclusion of an extra card - the Happy Squirrel. Lighten up. Do not take yourself, or anything, too seriously. There are no simple answers, life is very complicated and the most important thing is to take joy in the journey. 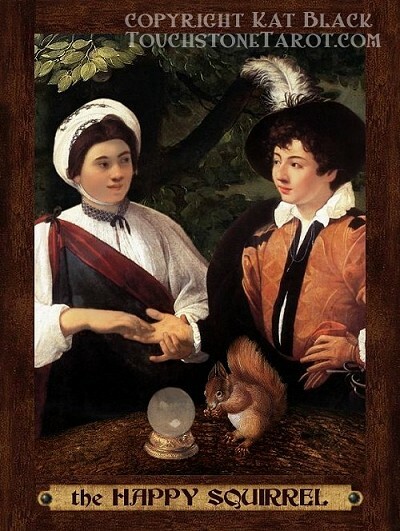 The first deck to include a Happy Squirrel card to my knowledge was one of my favourite decks, sadly now out of print - the Victoria Regina Tarot by Sarah Ovenall. The Happy Squirrel card unfortunately wasn't included as a 'real' card in that deck, it was just available as a digital download. You can still see it at theFool.com. The first deck to include the Happy Squirrel as an actual, printed card in the deck was, I believe, the quirky International Icon Tarot by Robin Ator. You can see the card in an interview with Dan Pelletier on the wonderful TarotGarden.com site. If you know of any others, let me know and I will happily link them. I think every deck should have one! I love the idea of a Happy Squirrel card for so many reasons, and was determined to include one in Touchstone. 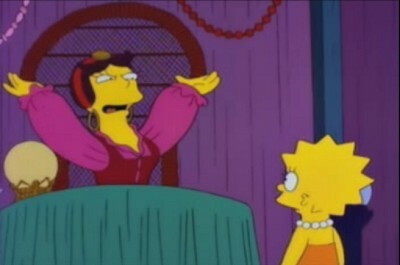 The Simpsons go to a Medieval Faire. 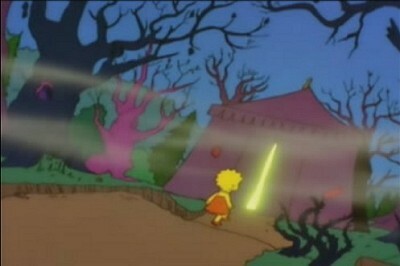 Lisa chases an escaped rabbit Alice-in-Wonderland style into a dark wood. She comes upon a Fortune Teller's tent in a forest from which an unearthly light glows. 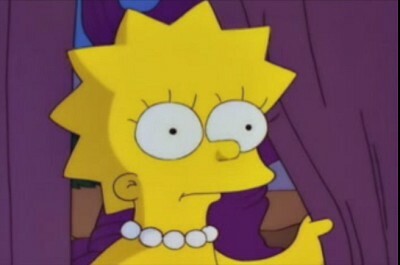 "I've been waiting for you Lisa..."
(Gasp!) 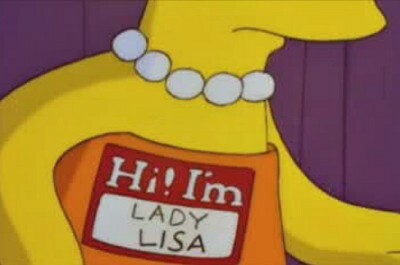 "How did you know my name?" "Would you like to know your future?" 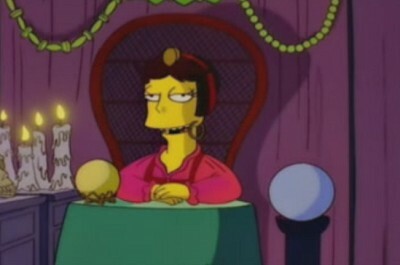 "Sorry, I don't believe in Fortune Telling. I should go". She pulls back the curtain to leave. "What's your hurry? 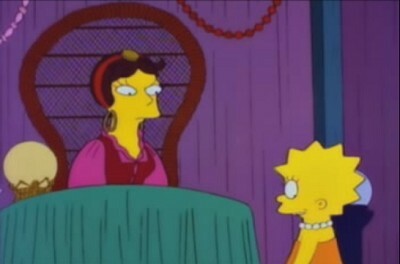 Bart, Maggie and Marge are at the joust and Homer is heckling the puppet show..."
"Wow, you can see into the... present". 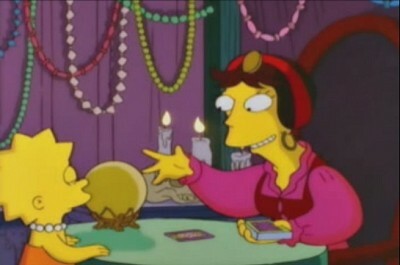 "Now we'll see what the future holds..."
The fortune teller holds up a tarot deck. 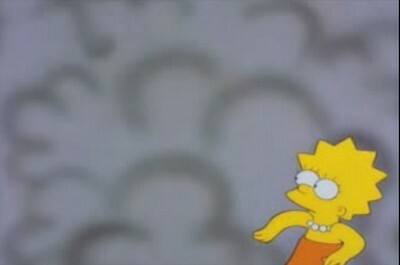 Dramatic music as she tosses down the Death card. 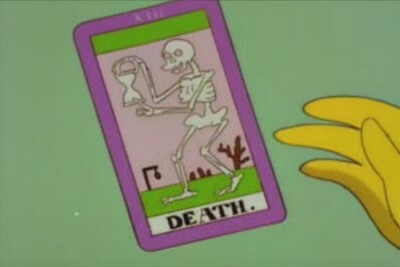 "The Death card?" 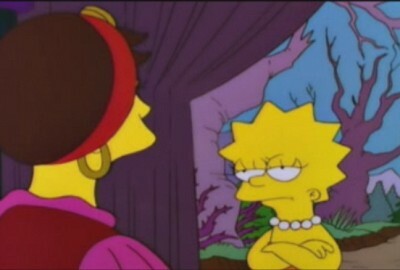 says Lisa nervously. "No, that's good! 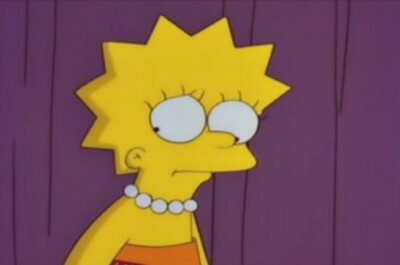 It means transition, change..."
Lisa sighs in relief. 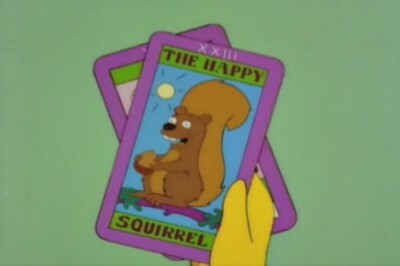 The fortune teller then throws down a mythical card - XXIII The Happy Squirrel. 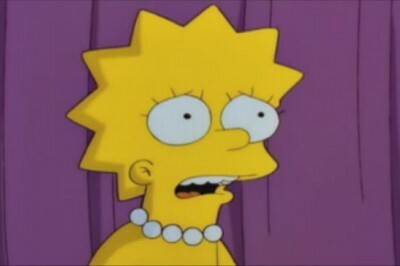 Lisa giggles and says "Aw, that's cute!" 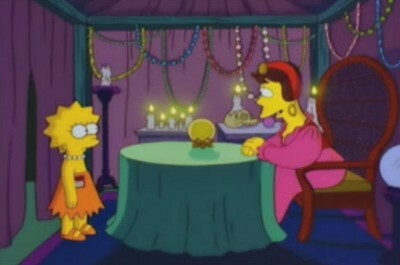 The fortune teller throws her head back and gasps. "The Happy Squirrel!" 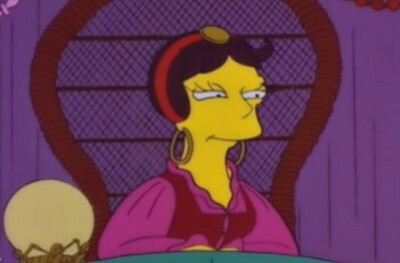 "Possibly, the cards are vague and mysterious" the fortune teller says dismissively, with a shrug. "They seem to be revealing the story of your first love. Do you want me to continue?". 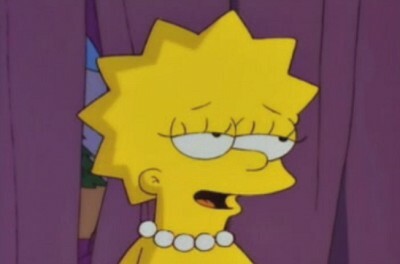 Lisa gulps. "I guess so..."
"It's coming to me.... yessss.... I see an Eastern university in the year 2010. 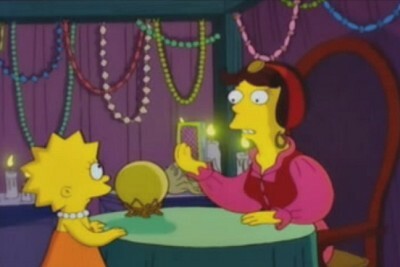 The world has become a very different place...."
The fortune teller deals another mythical card, XXV - The Fiance. 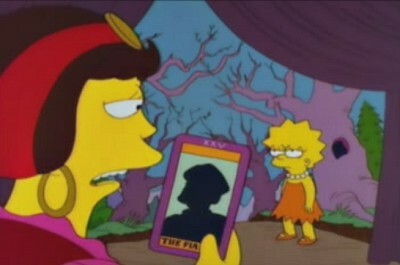 "The next day, Hugh goes back to England, and you never see him again." 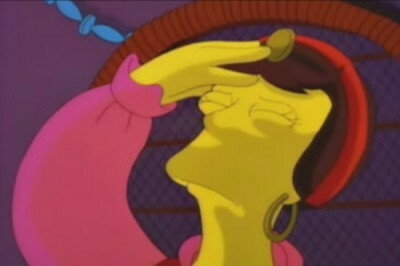 "Wow, now that I know all this, isn't there any way to change the future?" 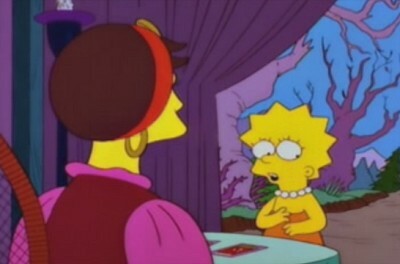 "No, but try to look surprised" replies the fortune teller smugly. "I thought you said you'd tell me about my true love?" 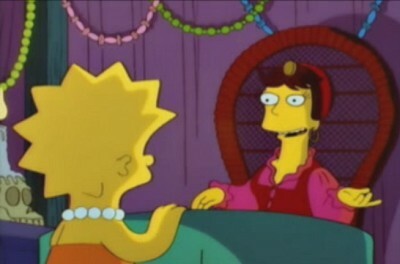 "Oh, you'll have a true love, but I specialise in foretelling the relationships where you get jerked around." Which clears, leaving them both looking uncomfortable. 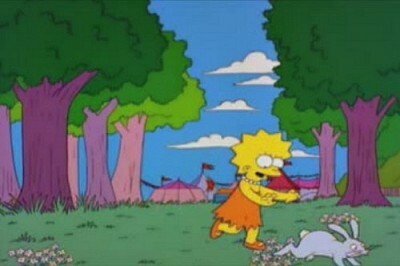 Lisa backs away out of the tent.